Nominated for the CILIP Carnegie Medal 2017, this fantasy epic from the No. 1 NEW YORK TIMES bestselling author of the Grisha trilogy is gripping, sweeping and memorable - perfect for fans of George R. R. Martin, Laini Taylor and Kristin Cashore. Criminal prodigy Kaz Brekker is offered a chance at a deadly heist that could make him rich beyond his wildest dreams - but he can't pull it off alone. Kaz's crew is the only thing that might stand between the world and destruction - if they don't kill each other first. Leigh Bardugo is the number one New York Times bestselling author fantasy novels and the creator of the Grishaverse. 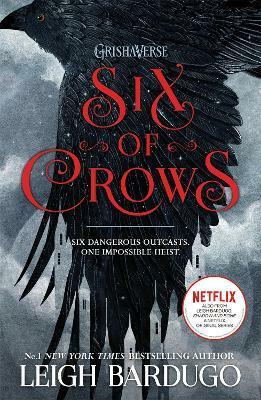 With over one million copies sold, her Grishaverse spans the Shadow and Bone trilogy, the Six of Crows duology and The Language of Thorns. She was born in Jerusalem, grew up in Los Angeles, graduated from Yale University, and has worked in advertising, journalism, and most recently, makeup and special effects. These days, she lives and writes in Hollywood, where she can occasionally be heard singing with her band. Find her website at www.leighbardugo.com and follow her on Twitter @lbardugo.